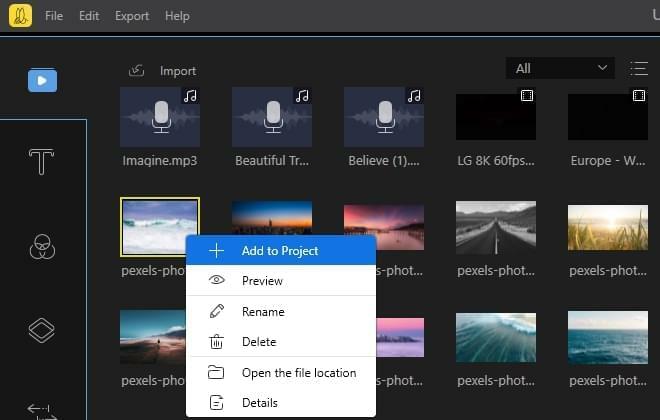 We can import media files to edit after creating project. 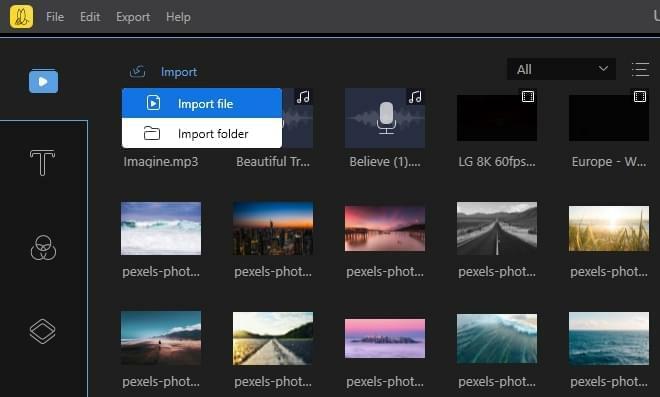 There are two ways to import: one is by clicking "Import" > "Import file" to open single or multiple files; another is by clicking "Import" > "Import folder" to import all the files in the folder. In addition, we can also import files using drag-and-drop via your mouse. After importing files, we need to add them to the tracks below for editing. There are two ways to do this: one is by right-clicking a file and choosing "+ Add to Project"; another is using drag-and-drop via your mouse. 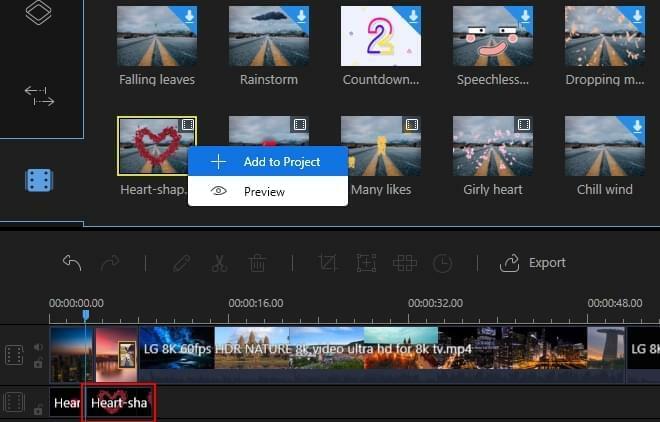 To split a video, highlight it on the track, move the playhead to the point where you need to split, then click "Split" button or press "Ctrl+B". To merge videos, drag all the clips to the video track. You can arrange the order of videos by selecting and moving them to left or right. To delete a clip from a video, split the video, and then select the clip. Afterwards, click "Delete" button or press "Delete" key on the keyboard to delete it. To crop a video, highlight it on the track and click "Crop" button. 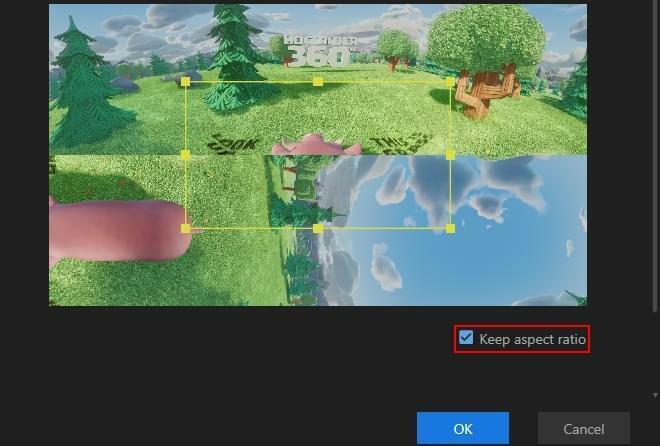 If you don't check "Keep aspect ratio", the black bars will appear in the video to avoid image deformation. In contrast, if you check "Keep aspect ratio", you won't come across this problem. To zoom a video, highlight it on the track and click "Zoom" button. 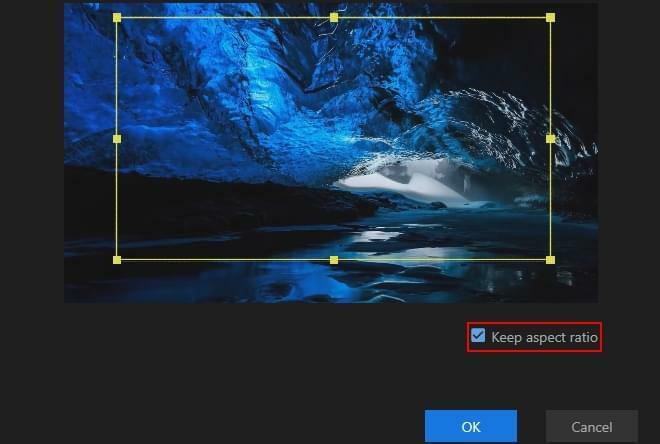 We can check "Keep aspect ratio" to prevent distortion of the video while zooming a video. 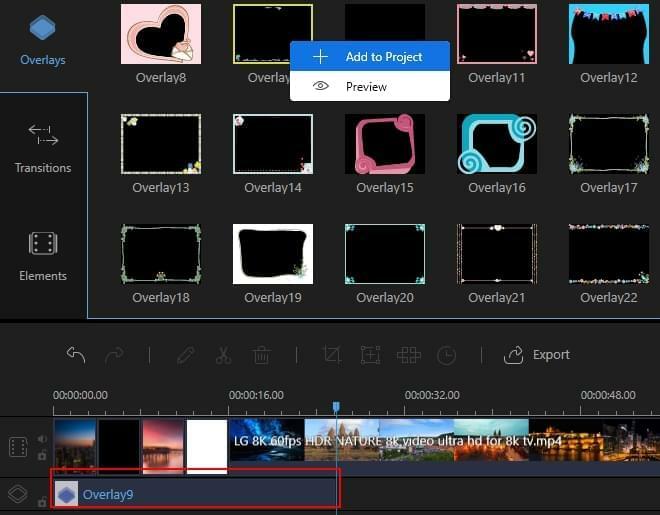 Double-click the video on the track, then you can choose to rotate it 90°anticlockwise/clockwise, flip it horizontally/vertically in the editing panel. After finishing setting, click "OK". Double-click the video on the track, and then you can change its speed by dragging the slider in the editing panel via your mouse. If you speed up the video, its timeline on the track will become shorter. If you slow down the video, its timeline on the track will become longer. Highlight video on the track and click "Mosaic" button enable it. Click "Add" button, and then the yellow rectangle will appear on the left top window. You can move the rectangle to the area where you want to add mosaic. Drag the borders of the rectangle to adjust its size. Move the percent slider under the rectangle to change its pixels. Please note that the mosaic will appear in the whole video you selected after adding it. 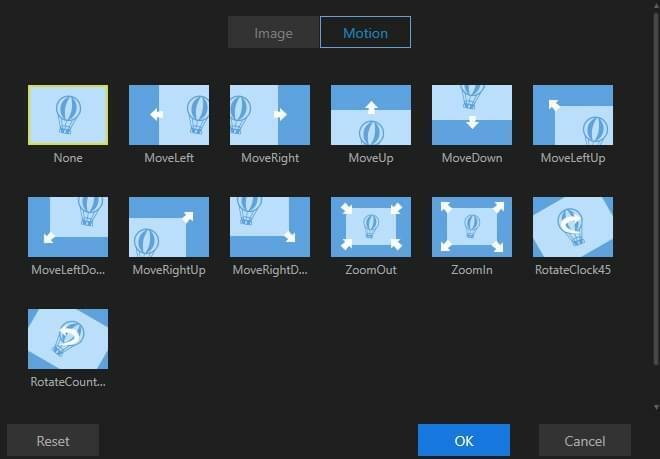 There are two purposes to use the element: one is to drag it to video track and use it as a wonderful intro or outro; another is to drag it to PIP track and create a PIP video. After dragging the element to video track, you can vary its playback speed, color, etc. by double-clicking it. After dragging the element to PIP track, you can add mask, fade in/out audio by double-clicking it. Click "Filters" tab on the left to enter Filters area. Double-click the template to preview it instantly. 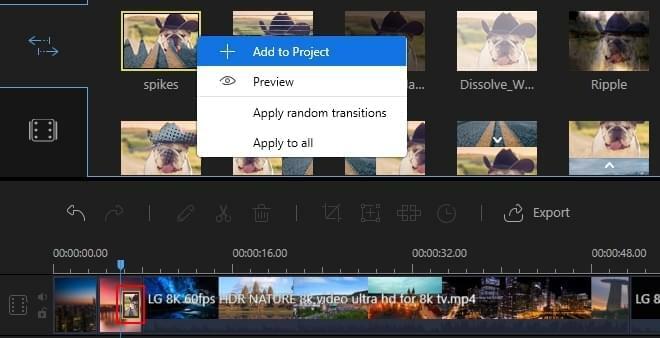 To add filter to video, highlight the proper one, right-click it and choose "+ Add to Project". 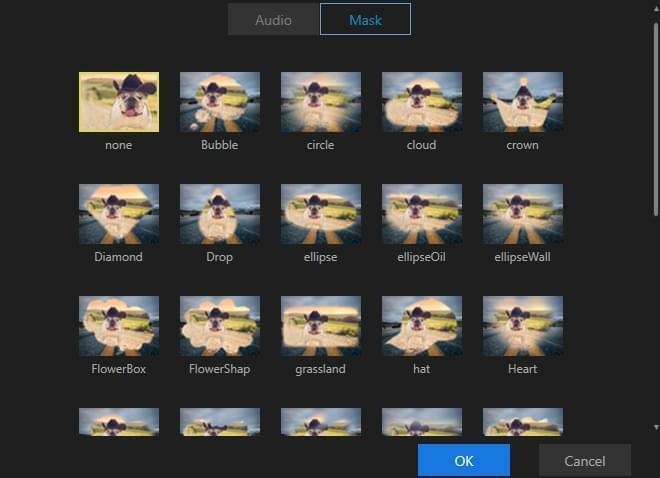 You can also use drag-and-drop to add filter to video via your mouse. Please note that default duration for the filter on the filter track is 4s. If you need to add filter to the whole video, drag the sides of filter on the track to change its duration. Open Transitions tab, highlight the one you like, and drag it directly to the position between two video clips via your mouse. Note: if you want to add more, please repeat these steps. Open Text tab, highlight the one you like, and drag it directly to text track below via your mouse. 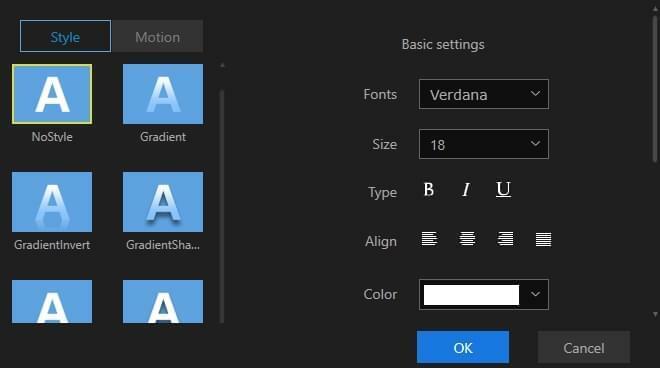 Double-click the text on the track to customize its style, font, color and motion. Open Overlays tab, highlight the one you like, and drag it directly to overlay track below via your mouse. Highlight overlay on overlays track, and drag both sides of it to change its duration. 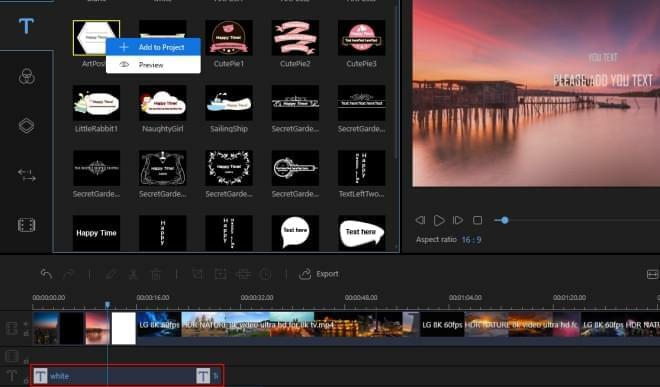 Double-click video clip on video track to launch its working area. 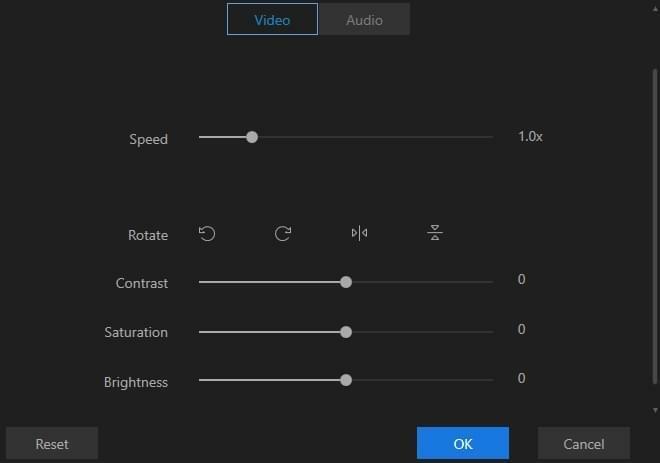 You can set playback speed, contrast, saturation, brightness and hue of video instantly. After finishing setting, click "OK" to save. Double-click video clip, select "Audio" in the pop-up editing panel. You can set its volume, fade in/out audio. There are two ways to change background music: one is by clicking the “Mute” button on video track to remove sound from the video and then drag your own background music to the audio track below. 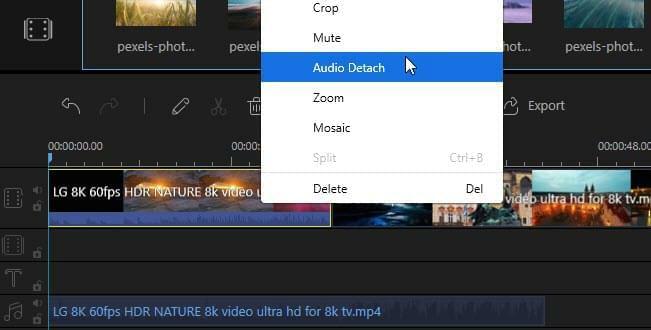 Another way is by highlighting video, right-clicking it and selecting "Audio Detach" to detach original audio to audio track, delete it and drag the new background music to the track. 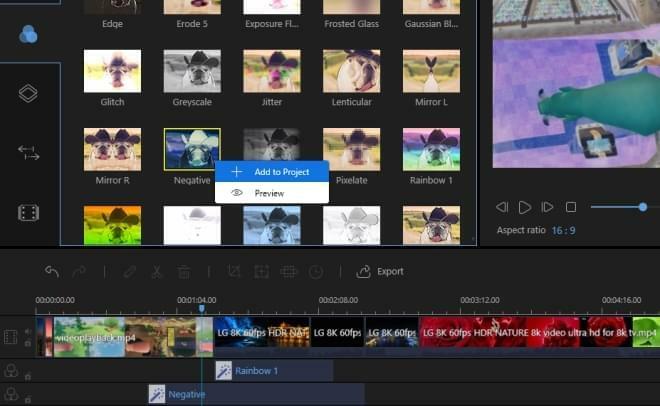 After importing a picture, right-click it and choose "+ Add to Project", and then the picture will be added to pointer position on the video track. If you want to add a picture to the position between video clips, you can do it using drag-and-drop. 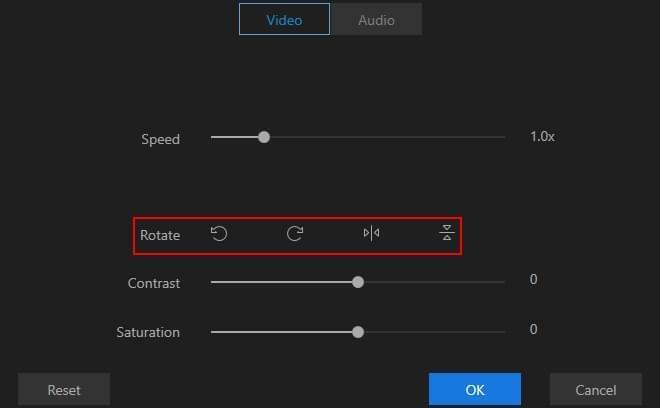 After adding picture to video track, double-click it to rotate, change its contrast, brightness, add motion, etc.